CALGARY - Alberta Premier Alison Redford says it isn't up to her government to decide whether to cut school fees for students affected by flooding in High River last June. The community was devastated about 10 weeks ago by high waters that swamped a significant area of southern Alberta. Wildrose Opposition Leader Danielle Smith wants school fees cut for every student in High River. She says parents need a break because most families haven't received any money from the province's disaster recovery program. 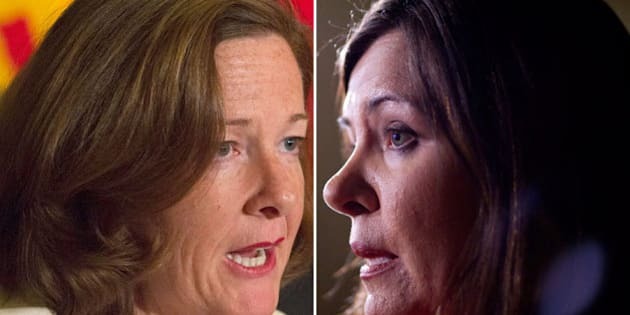 Premier Alison Redford told reporters in Calgary that it's not appropriate to come up with "extraordinary remedies" to deal with particular circumstances. She also pointed out that fees are under the jurisdiction of local school boards. "We've been very clear that school fees are decisions that are made at the local level. They're a discussion that takes place between parents and local school boards," Redford said Tuesday. "The communities need to make those decisions and we're not intending to change that policy." She added that 80 of 83 schools affected by flooding welcomed students back Tuesday with the exception of one in Calgary and two in High River, which have been delayed a bit. The premier also rejected suggestions that money for disaster relief has been slow in coming. "There are 8,200 active files where (disaster relief program) representatives are working with people who have made applications. And in 1,800 of those circumstances — approximately 25 per cent — cheques have been written." The Wildrose party is coming up with ideas that do nothing more than "exacerbate differences" between communities, Redford suggested. "I'm pretty sure as we head into political silly season, which seems to be all year now, that we're going to see people say, 'Well, we need to fix this because of this problem,'" she said. "These are particular circumstances ... there is a policy that we have in place with respect to school fees. We believe it's important for school boards and communities to make decisions with respect to that." Liberal member of the legislature Kent Hehr was critical of the Wildrose as well. "Give me a break," he tweeted. "Calling for an end to mandatory school fees is sheer hypocrisy. Disingenuous to say the least." On another flood-related matter, the Wildrose leader has scheduled a townhall meeting in High River for residents concerned about the RCMP's entry into flooded homes and seizure of guns after the floods. Smith has tweeted that she hopes the premier will come to the event on Thursday. Smith wrote: "1,800 residents had their doors broken down." Redford said she was unaware of property damage and has already spoken about the seizure of firearms during the town's evacuation. "The leader of the Opposition has to stop sensationalizing these issues. Seizure of guns and destruction of property? So we now have the leader of the Opposition saying that the RCMP destroyed property during what was the worst natural disaster in Alberta's history? "I don't buy that. I think it's about time the Opposition, including the leader of the Opposition, tried to come up with some forward-thinking solutions instead of preying on people's fears and frustrations, because that's not how we build Alberta."